Manufacturer & Exporter of Pump Testing Panel. Our product range also comprises of Power Analyzer, Power Meter and Digital Iron Loss Testers. We are manufacturer and supplier of Digital Pump Testing Panel. These testing panels are fabricated using quality approved components and are also tested on stringent parameters. We offer this panel in various customized options in order to meet the requirement of clients. 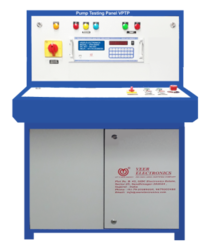 We are highly engaged in offering superlative quality Automatic Pump Testing Panel. These testing panels are fabricated using quality approved components and are also tested on stringent parameters. We also, ensure our clients to deliver a quality assured range of Pump Panels. Our assortment is developed from superior quality raw material such as metal sheets and other electrical goods procured from the most eminent and trusted vendors of the market.